I realise it seems a strange title – ‘and other salad-style cheeses’ – but Feta is a bit of a sensitive subject these days. Granted PDO protection in 2002, true Feta can now only be made from goat’s and ewe’s milk in several mountainous regions of Greece. On the one hand, it seems cheesy poetic justice, given that the first record of cheese-making was probably in Homer’s Odyssey and featured a suspiciously Feta-sounding recipe but, on the other hand, the decree was a blow for many cheese-makers across Europe and beyond who had been making ‘Feta’ for generations and now had to find another name for it. At first glance it seems a pretty boring Cheese Challenge choice – salads, salads, salads, whoop-dee-doo. But a closer look reveals its versatility as a cheese for pastries, pizzas, pastas and even puddings. Salty and tangy it’s a match for fruit and meat alike. Aside from the official Greek Feta, similar cheeses can be found in countries such as Turkey (Beyaz Penir), Slovakia (Bryndza PGI), New Zealand (Te Mata Mt Erin), Germany (Weisslacker) and Denmark (salatost or branded Apetina) – who were particularly irked by the Greek PDO decision. And, as ever, Britain and Ireland are holding their own with cheeses such as Yorkshire Fettle, Homewood Greek-Style Brined Cheese, Ffetys from Y Cwt Caws and Knockdrinna’s Greek Style Salad Cheese. 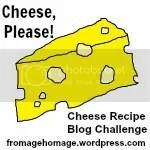 Want to take part in August’s Cheese, Please! Recipe Blog Challenge? Check out the full rules here. After making a thoroughly authentic journey overland from India in 1985 and finding myself in central Turkey with a taste for feta, I went to the local shop for a sample. The very friendly woman in charge (women do ALL the work there, men at tea-shop/mosque) dragged out a large tin of the stuff from under the counter which was proudly labelled ‘Made in Scotland’! wait – are you sure that protection applies to Feta? i thought that criteria applied to Halloumi, but i could be mistaken…. Definitely the case, yes. There was a big legal battle involving Denmark and Germany but they lost. Halloumi has protected (Cypriot) status in the US but not PDO status in the EU (yet). ahh, ok. i had read about Halloumi, since i went through (uh, still may be going though) a big Halloumi phase… i’ve never noticed any such designation for Feta in the US, but i may have just missed it. There used to be a Yorkshire feta, but it had to be renamed because of the EU ruling… still tastes bloomin’ good whatever they call it though – I’ll have to get thinking about a recipe for this month’s challenge! Yes – think that’s the Yorkshire Fettle one above (made by Shepherd’s Purse). Look forward to seeing what you come up with. Um, question… if my recipe has equal parts feta and ricotta, does it still count for the feta challenge? ?